A red alarm from a nearby monitor started beeping. My husband, Jason, stretched out in a recliner next to our son’s hospital crib, didn’t look up from his crossword. "Not Sam’s," he said to his newspaper as the nurse rushed to the baby on the other side of the curtain. There were more curtains than walls in the Children’s Hospital Cardiac Intensive Care Unit (or as we and the nurses referred to it, the "C.I. "), so we sat inside a sealed tank of irritating yellow alarms, insistent red alarms, and earth-shattering-your-world-is-under-attack code blues. After three weeks in the C.I., Jason and I knew the beeps. We even made a game out of it: one of us would imitate an alarm and the other would have to guess which one it was. "Ventilator!" Jason would shout after I mimicked a beep. "Not specific enough," I’d counter. He’d rub his chin for a moment while I did it again. "O2 sats low!" He’d smile at me, deep brown eyes triumphant. Humor conquered fear here, and we found comfort in mastering the machines’ terrifying noises, alarms settling into the background like the creaks of our living room. I knew those sounds well. I’d spent so much time by Sam’s bedside; I struggled to leave his side. It had taken two weeks of comments, questions, and commands to get me out of Sam’s hospital room at all. From my husband, every night at 11 p.m.: "Why don’t you take the sleep room tonight, babe?" From my oldest friend, Karen, a doctor: "Unless you are physically attached to one of the machines, you really need to get out of the hospital every day. Seriously, Kris." From my sister, Stephanie, also a doctor: "You look really tired. When was the last time you left this room?" "Mama, why don’t you let me take care of your sweet baby tonight?" I looked up into her soft eyes, wrinkled in the corners with outstretched little lifelines. "I will not take my eyes off him," she assured me. "I will call you if anything happens." She patted my knees through the blue hospital blanket with hands rough and crinkled. She smelled like lavender and antibacterial soap. "Good mamas need their sleep." I nodded and padded out the doors of the C.I., rubbing sleep and tears from my eyes all the way to the pitch-dark sleep room, but not before pumping my breastmilk, labeling it, and giving the night nurse instructions on how to keep my three-week-old baby alive. She would nod rhythmically, giving me the smile and shoulder squeeze of someone accustomed to hearing ludicrous directions from panicked parents. As I lay on my side in the sleep room and sniffled, I still heard those heart-piercing beeps as if my head were underwater, the world above blaring with war. My husband mumbled something soft and threw his arm around me, his chest rising slowly and deeply into my back until my insides relaxed. I didn’t wake up until the nurses’ shift change. My greatest feat, though, was a week later when I agreed to leave not just the C.I. but the whole hospital. My mission: to purchase running shoes. After a grandma pointed to my postpartum belly and said to the nose-picking boy next to her, "Look! That lady’s got a baby in her belly! ", I felt even more motivated. My friend Smithy, an avid runner, had been encouraging me to transform the hospital into my own personal training facility since the day after Sam was born. "Look!" she’d say, pointing down a wide, purple hallway. "You can do your lunges all the way down and back, and then. . . ." She next identified a bench perfect for tricep dips, a wall for modified push-ups, and a carpet for Pilates. After two weeks of breathing hospital air, I ventured out the front doors of the hospital, cell phone in hand with the volume turned all the way up. I looked up at the hazy sky, wanting to be back by Sam’s side. Even though he hadn’t opened his eyes much yet, I wondered if he could tell that I was gone. 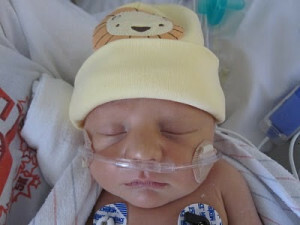 His seven-and-a-half pound body was without me for the first time, and he had just undergone major open-heart surgery. When I was twenty weeks pregnant, an ultrasound revealed that the new baby—temporarily named "Wolfie" by my A.P. Literature class—had a rare and serious heart defect called hypoplastic left heart syndrome. The whole world stopped for a moment. When it started again, my husband and I were holding onto each other and trying to absorb the hurtful differences between the color-coded pictures of normal hearts and the diagram of our baby’s defective heart. The only thing I could understand at the time was this: the entire left side of my baby’s heart didn’t work and would never work, and he would need life-saving open-heart surgeries to have even a one-in-five chance at survival. 1. Wolfie could have three risky open-heart surgeries: At one week, six months, and two years of age. These surgeries would reroute his heart and lungs so that the right side of his heart would do the work of both sides. This seemed impossible, but the doctor kept saying it was his best shot. 2. If Wolfie was not a good candidate for surgery, he could be put on a list for a heart transplant. Which meant that we would be waiting around for months, trying to keep him alive while hoping for a healthy baby to die so we could have his heart. 3. We could give Wolfie "comfort care" when he was born and let him pass away peacefully. This, after 40 weeks of carrying him in my body and falling in love with him. 4. We could terminate the pregnancy immediately. Not for us. We had already been down that empty road. My husband spent the rest of the weekend in that silence while I attacked the Internet with manic energy. I found comfort in words, so I researched hypoplastic left heart syndrome on every medical website and personal blog I could find. I perused pictures of healthy and not-so-healthy looking babies with severe heart defects. I watched gruesome videos of the three surgeries. I dug into the statistics of University of Colorado Children’s Hospital and scrutinized its rankings. I discovered that Wolfie had roughly an 80 percent chance of surviving the first surgery and a 90 percent chance of surviving each of the subsequent surgeries. Those statistics sounded great until I realized they were talking about my baby. My husband and I alternated between snapping at each other over a messy kitchen to spending silent evenings in separate rooms as we started to understand our baby’s illness. But we shared one flickering realization: Wolfie had a fighting chance. Maybe not the 99 percent chance that most other babies had, but he always looked happy in his ultrasounds, just kicking blithely away in a sepia baby pool. Now, five months later, there he was—no longer Wolfie the fighting fetus, but Sam the sick newborn, lying in a little box, hooked up to a ventilator and 4,000 other tubes while I was shopping for new running shoes. When I reached the shoe aisle of the sporting goods store, I grabbed the first pair of Nike Frees I saw in my size without even trying them on. I rushed to the sports bra aisle and did the same thing. I rushed back to the car, flinging my plastic bag into the passenger’s seat so I could, for the twentieth time in twenty minutes, check my phone for messages. There were none. I leaned back, breathed, and noticed a little coffee shop on the other side of the parking lot. Phone still in hand, I got out of the car and wandered over there. A round woman working the espresso machine was comforting a mousy co-worker. "Girl, he’ll come around," she said, with a gruff certainty. "Don’t pay no mind. He’ll wake up one day and take a good look at you and he’ll come around." Standing there waiting for my chai, I felt like an intruder, as if I had just walked into their living room uninvited. But I wondered who the "he" was, and if he really would wake up and come around. She seemed so sure of this that I smiled, imagining she was talking about Sam. When I got back to our room, Sam lay calmly in his flat, square bed. He was hooked up to what could only be likened to the commanding bridge of the Starship Enterprise: electric boxes with green screens dripped medicine into Sam’s bloodstream; white plastic leads connected him to a screen that blinked out his heart rate, his breaths, his oxygen saturations, and a few other numbers I was iffy on; a large bandage covered his forehead, transmitting numbers to a smaller screen behind his bed; a four-foot oxygen tank lurked in the corner; a warmer loomed over his body, which would be otherwise cold in nothing but this tangle of wires and a diaper with tiny Elmos. Dr. Buchwald, the attending doctor on call that week, wandered over to my side. No papers, no iPad. She just followed my gaze around from machine to machine, and then to the baby whose heart formed the wheel of all these spokes. "Amazing, if you think about it," she said, pushing the flaps of her black blazer behind her hips. "Yes," I said. I wasn’t sure if she was referring to the commanding bridge of the Starship Enterprise or its tiny captain. "All these wires and all this technology," she gestured to the stacks of machines enveloping Sam, "and none of it even comes close to approximating the anatomy of a mother." She looked at me with a hesitant smile, like she was waiting to see if I shared her same fascination. I did. She continued. "Dozens and dozens of cords, a room full of carefully engineered machines, a balancing act of medicines, x-rays, echoes, nurses, surgeons. . .and none of it"—she gazed down at Sam—"none of it even comes close to what your umbilical cord did for the last ten months." I looked down at my partially deflated belly. Since finding out about Sam’s heart, I had felt let down by my insides. Even though the geneticist had told us that there was no known reason for hypoplastic left heart syndrome, I couldn’t shake the feeling that my body had done something cruel. Despite my daily chokings on prenatal vitamins, my refusal to eat sushi, and my inspection of all cheese labels to make sure they were pasteurized, my body had failed to give Wolfie whatever it was he needed to grow a left side in his heart. I hadn’t considered until now that it had also been his lifeline. For months, my nurse practitioner and I fingered the ultrasound printouts at the end of each appointment, smiling over his blurry hair, his thumb-sucking, and everything else that made him a normal baby. Rubbing my pregnant belly like a crystal ball, I’d ask, "What else should I be doing?" She always replied, "Just keep him in there." Each time she said that, I felt defeated. I figured this was her way of telling me there was nothing to be done. Now, standing among the cold clicks of machines, I realized by "keeping him in there," my body had been feeding him, massaging his heart, protecting him. Even now, my pumped milk found its way through the tubes and into his body, one measured drop at a time. When I put my lips next to his peach-fuzz earlobe and sang to him, my voice slowed his breathing and relaxed his muscles. He needed the tubes and wires, but he also craved my arms, belly and breasts—their softness, their warm skin that smelled just like his. My deflating body had earned each rise and fall of his healing, palm-sized chest. I glanced at the Nike box in the corner. My body deserved to heal, too. Sam was still sound asleep in his cubicle of tangled cords, oxygen blowing into his gumdrop nose. Pulling out my new shoes, I wondered what it would feel like to run after carrying a human in my body for 40 weeks and then pushing him out. My husband turned his head away from March Madness to catch me and say, "Babe—why don’t you go try out your new shoes?" He nodded and smiled. "Just take it slow." So I whooshed through the hospital’s sliding doors in my turquoise running shoes and new sports bra and into the warm, spinning world. As I turned on my iPod, my fast walk lurched into a lumbering jog. My insides groaned and cramped as if my organs had been shaken loose. While I had never been a great runner, my legs had never felt this heavy, nor my body this uncontrolled. I had to jog with my knees together to keep everything inside of me from falling out. I kept forcing each foot into the pavement, though, and my legs began to feel more fluid, my body more solid. My cell phone, still in hand, remained quiet. With each step, my liquefied insides grew firmer, and it seemed that everything inside of me might stay put after all. After about ten minutes, I was breathing and looking around, conscious of my path but unaware of the mechanics of my body. I looped around the hospital a few times, stretching my tether to Sam, until I was satisfactorily out of breath. Beautiful story and beautifully written Kristin.